The “right” strategy doesn’t start with slick technology. It begins with the customer itself—your marketing goals, and whatever business challenges keep you up at night. We embrace the truth that your software partner needs to understand your goals and challenges before addressing them. Our software and products have continued to evolve and incorporate market-leading practices. We are excited about our new management team, ownership structure, and future product plans. We have new platforms on the horizon that will better enable you to generate new revenue and greater profit margins, both for yourselves and your clients. Together, we will partner with you and your clients to achieve better results and differentiated market offerings. The existing integration between CHILI and DB Commerce has already generated much excitement among customers in offering advanced editor capabilities with built-in controls to maintain brand compliance. CHILI publisher frees up time in packaging and marketing artwork creation and enables a more streamlined deployment of creative and budget resources. "Our solution is going from niche to mass thanks to all the applications our customers and partners are creating and the results they are achieving." says Kevin Goeminne, CEO of CHILI publish. DemandBridge congratulates CHILI's success and is happy to be a part of its continued growth. We are excited to launch the DemandBridge Learning Center, bringing learning online without leaving your office! As part of the learning center, we have developed several knowledge building webinars designed to educate users of the software on best practices, platform navigation, workflow efficiency, setup, configurations, new releases and much more! A monthly webinar schedule will be sent in advance so that you may register. WHO MAY JOIN Any interested individual and user of the software is invited to participate. REGISTRATION Webinars require pre-registration and are complimentary, unless noted otherwise. LENGTH OF WEBINAR Each presentation will be 45 minutes in length and allow for 5-10 minutes of question and answer at the end, moderated by DemandBridge staff. HOW TO SIGN UP Instructions for connecting to the webinars will be included in the confirmation email upon registration. Webinars will be archived. A link to the recording of each webinar will be available to all participants in the post-webinar follow-up email. Course materials may accompany if applicable. Please mark your calendars and register today! This session will focus on the distributor administrator role within the "Work with Companies" area. We will provide an overview of the myriad of options, and then focus in on those most frequently used. Topics will include (but are not limited to): site theme, splash page, password settings, credit card options, order transmission settings, freight, ship-tos and cost centers, & checkout screen configuration. This session will focus on the distributor administrator role within the "Work with Items" area and compare that to the subset of options that can be maintained from the customer admin role. We will cover descriptions, images, keywords, customization settings, price options, item specs, catalog assignment, and vendor assignment. We will also visit the "Work with Vendors" area to configure transmission for fulfillment by a supplier. Add a drop-down option to a completed template to auto populate addresses. DemandBridge is excited to sponsor the 2019 PSDA CEO Summit, March 11-13 in Fort Lauderdale where PSDA executive members have the opportunity to connect with the best in the industry, discuss high-level trends, and share ideas and challenges. Last year, more than 80 percent of attendees said they met someone new or renewed a relationship that they expected to lead to new business. We look forward to seeing you and are eager to discuss our new industry-leading promotional products workflow. We will see you soon! Look for the cool gadgets that DemandBridge has waiting for you in your event registration packet. The November 2018 issue of Print + Promo Magazine features their annual Top 50 Distributors analysis. DemandBridge is proud to note that 64% of the top 50 highest performing distributors are members of our wonderful DemandBridge client family. DemandBridge, a dominant Marketing Automation Platform provider to approximately 600 Marketing/Print Services firms, announced today that they have signed a letter-of-intent with The Ampersand Group, agreeing in principle to forge a strategic alliance to provide an array of business services associated with on-boarding, implementation and operating the DemandBridge suite of products. The Ampersand Group, located in Akron, Ohio, has a national network of entrepreneurial business owners who use Ampersand’s back office services and sales support to increase sales, reduce costs, increase profits and thus expand their businesses. By offering technology implementation services, finance/accounting services, eCommerce template building, strategic buying services and sales enablement, The Ampersand Group will help their member companies spend more time on revenue generating opportunities. DemandBridge CEO, David Rich sat down with Print+Promo to talk about how single-source software solutions can up your marketing game. Check out part one of this two-part series, and check back on 10/30 for the conclusion! “When seeking a software solution, don’t just think of what your best clients need; think of what your next clients need,” said DemandBridge Chairman and CEO David Rich. And he should know. With more than 1.2 million registered users and over 3,000 brands across the retail, health care, franchising, financial, energy and nonprofit verticals, his company’s successful platform allows distributors to service customers on many aspects of their marketing and sales efforts—from hard goods to full digital distribution of their content. Thanks to single-source software solutions offered by providers like DemandBridge, distributors can take cumbersome marketing efforts and enable those tasks through a user-friendly interface branded to their customers’ standards, thereby building true partnerships with end-users. To better understand this concept, we started our own dialogue with the DemandBridge executive. In part one of this two-part series, Rich detailed the needs of marketing teams and how industry software solutions fit in. Exciting things are happening at DemandBridge since expanding our capabilities with the addition of both e-Quantum and Kramer-Smilko. Our team is looking forward to attending and sponsoring the 2018 PSDA P2P Technology + Innovation Summit where we will demonstrate new product integrations, the new DB Commerce white label demo site, new industry-leading promotional products workflow development, and the new quote uploader feature in DB Sourcing. Plus, learn about how to join our exclusive Sourcing Exchange with more than 100 distributors and suppliers (limited space available)! DB Commerce Connectivity has been a long-time advantage of DB Commerce, facilitating quick site implementations through availability of data, and ensuring current information for items, inventory, and pricing. Our teams have worked diligently this year to bring that integration to fruition between DB Commerce and e-Quantum, from site creation, all the way to order placement. Equally important are a modern look and feel and feature-rich solutions for customization of marketing materials and options for digital delivery. We look forward to sharing our new demo site with you and providing the efficiencies needed to turn your customer ordering experiences into best in class solutions. DB Sourcing With our new quote uploader, responding to requests for quotes has never been easier. Suppliers can more efficiently serve their distributor partners by exporting output generated from their estimating systems and uploading that output directly into DB Sourcing. Those enrolling in a public exchange can also map their own unique format to the required fields by DB Alliance. Many configuration options are available that provide an opportunity for integration with a wide range of systems. In other news, on the heels of a successful integration between e-Quantum and DB Commerce, our development teams are actively working on making our sourcing solution available to e-Quantum users in Q4. DB Reporting Our best in breed reporting offering helps you and your clients manage their marketing spend across all aspects of a corporate storefront with access to insights in real-time across their entire global spend. No-longer are the times where a client needs to see canned reports or the customer service team creates spreadsheets at month end. Give your clients 24/7 control and transparency to view/create custom dynamic reports when they need them. Our business analytics tools deliver a 360-degree view across your entire business to help you make decisions now to enable the ability to change outcomes. Give your clients and your business what it needs - real-time action. At DemandBridge, we believe in providing our customers with the highest level of customer service and amongst our priority is increased responsiveness. We are happy to announce that we are deploying the DemandBridge Support Portal, powered by Jira Service Desk, a true ticket and issue tracking platform, across all offices and products. It provides greater efficiencies and consistent customer support. We are also implementing "ONE DEMANDBRIDGE" based on top in class agile development techniques, as our product planning and engineering platform. Attending the 2018 PSDA Summit? Please stop by our booth (#137) to learn more! 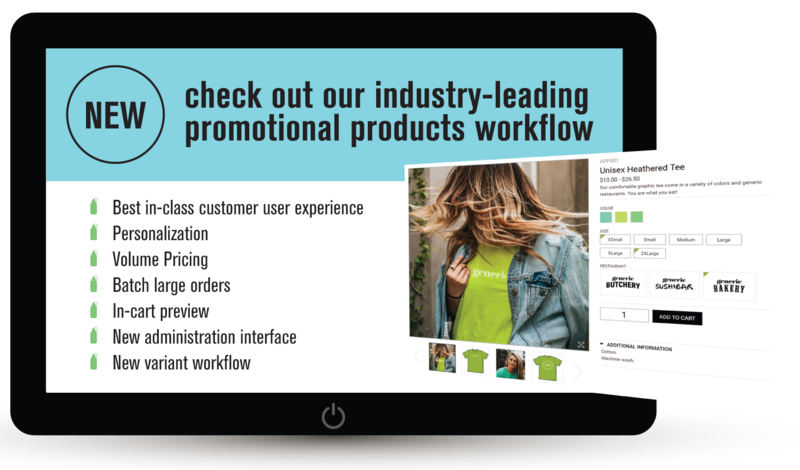 Ask us about the new DB Commerce demo site and get a sneak peek at our promotional products workflow. Unable to attend the 2018 PSDA P2P Summit? Contact us for more information by emailing info@demandbridge.com. Announcement of Office Relocation for Kramer-Smilko, Inc.
We are proud to announce that effective August 31, 2018, our Kramer-Smilko office in Bel Air, MD will be relocating and combining with our DemandBridge office in Hunt Valley, MD. The new address is 10830 Gilroy Road, Hunt Valley, MD 21031. Our office number will remain the same, unless otherwise notified, as 410 569 5725. Same Great People, Software & Solutions in a Bright New Office! Where print and technology come together. DB Commerce DB Commerce (formerly DB Enterprise) provides a world class customer experience with real-time editing (Chili Publisher) and a full suite of digital content options to truly offer your clients the most complete marketing platform available. Users arrive at a brand-specific site where their permissions dictate what they see and how it is presented. Regulatory measures may be employed for business rules during customization, asset management, approvals, title compliance, budget, etc. Integrations simplify steps from single sign-on to data imports, or order processing from partner networks. DB Commerce now also includes a two-way integration to SalesForce CRM. DB Reporting Any data, any way, anywhere and in one view. Imagine your DB Commerce, DB Sourcing and DB Distributor data living together in one consolidated view. This is now possible with our move to the Azure cloud and the deployment of Power BI. In this webinar, we will demonstrate the Power of DB Reporting and the ease with which you can design your own custom reports. We will view live examples of our first set of standard dashboards that showcase visualizations of total sped, order count, items ordered and shipment summary. Whether it is delivering the information your customers need in a customized format, brand, and layout, or internal management and data analytics, DB Reporting is the solution. DB Sourcing + the DB Alliance Sourcing Exchange Whether your preference is for a private supplier network or a true sourcing exchange, Demand Bridge has the solution for you. DB Sourcing is an industry-specific, fully integrated tool that puts sourcing and project management at the users' fingertips; empowering them to organize, quote, and manage jobs more effectively. The DB Alliance Sourcing Exchange aggregates the collective purchasing power of distributors and brings suppliers to one marketplace benefiting distributors and suppliers alike. The term cloud computing is everywhere! Widespread adoption of cloud computing and the evolution of the end-user experience are dramatically changing business operations. Commonly, “the cloud” is mentioned and confusion ensues, but the reality is cloud computing provides a powerful and important force of change. There are many players in this space offering cloud services and amongst the more notable is Microsoft Azure. Here we explore the many opportunities migrating to the cloud offers as well as an introduction to Azure Cloud Collaboration Center, a first-of-its-kind facility that combines innovation and scale to address operational issues and unexpected events in order to drive new levels of customer responsiveness, security and efficiency. When you need to build and scale services more quickly than your platform allows, what’s the solution? DemandBridge, a marketing software provider that sells brand management platforms to marketers, turned to Cloud Foundry to meet customers’ growing expectations for speed and customer experience in a cloud-based era. DemandBridge previously operated its SaaS platform with a monolithic Java application on a large WebLogic application server. Moving to the cloud was a key element in their road map to prepare for growth, but just doing a lift-and-shift to a public cloud was not enough to meet their needs. “It was just a lot for us to keep up with, especially modifying our production application, which was getting bigger and bigger every time we did a release,” said Amer Mallah, Chief Technology Officer at DemandBridge. We're excited to announce our latest software improvements. Our programming and quality control departments have been hard at work and we're very excited to announce some improvements we've made to Version 12 of the e-Quantum program. We've listed some high-level changes below, and we'll also be discussing them in more detail in our upcoming, complimentary webinars. Avoid redundancy and connect related documents with Sales Orders: Enter order information once into the Sales Order and e-Quantum will do the rest, automatically creating any documents you need. You can now process credit cards using PayPal. PayPal is joining Authorize.net and PayTrace in the list of credit card processors that are both PCI compliant and integrated with e-Quantum and Quantum Net. REGISTER FOR A WEBINAR TO LEARN MORE ABOUT OUR V12 UPDATES! We will be hosting 3 webinars in the upcoming weeks to familiarize you with the exciting new features of e-Quantum Version 12. Three dates are offered for your convenience and all sessions will be held at 11am PDT (1pm CDT, 2pm EDT). Mark your calendars and contact us at 800 328 7804 to register. DemandBridge, an integrated business platform delivering seamless marketing solutions in the cloud, has been selected as the exclusive technology/integration partner of a new sourcing exchange. WebbMason Marketing, SupplyLogic, and Winbrook announced today they will be the initial founders/board members of this sourcing exchange that aggregates their collective spend and suppliers in one marketplace. One that they hope other distributors and suppliers will join as charter members/participants. They also announced selecting DemandBridge, an integrated business platform delivering seamless marketing solutions in the cloud, as the exclusive technology/integration partner. DemandBridge, who recently acquired e-Quantum and Kramer- Smilko, provides mission-critical ERP and eCommerce solutions to approximately 600 distributors. Their flagship sourcing platform (DB Alliance) will facilitate the virtual marketplace. In addition to DB Alliance, DemandBridge announced plans to continue investing in its next generation eCommerce, ERP and reporting/analytics platforms by integrating them with the e-Quantum and Kramer-Smilko product lines. Together, these Microsoft (Azure) cloud-hosted tools will cost effectively empower distributors and their supplier partners to improve efficiency, win business, and increase their revenues/profits. At its heart, DB Alliance is an industry-specific, fully integrated tool that puts sourcing and project management at the users’ fingertips; empowering them to organize, quote, and manage jobs more effectively. As more distributors and suppliers have joined the DB Alliance network, it has evolved into a true sourcing exchange aimed at helping those companies in their journeys to become fully digital organizations, thus, improving speed to market and growing their bottom lines. David Rich, CEO of DemandBridge, and the one leading the technology consolidation in the industry, commented... “The goal of our recent consolidation efforts is to better provide the industry with the technology platforms and services they need to successfully compete and to run their businesses. To the extent our 600 customers can standardize on the same tools, offering industry-shared services like Sourcing, Finance and Accounting, Back Office IT/Integration and end Client on-boarding services (e.g. 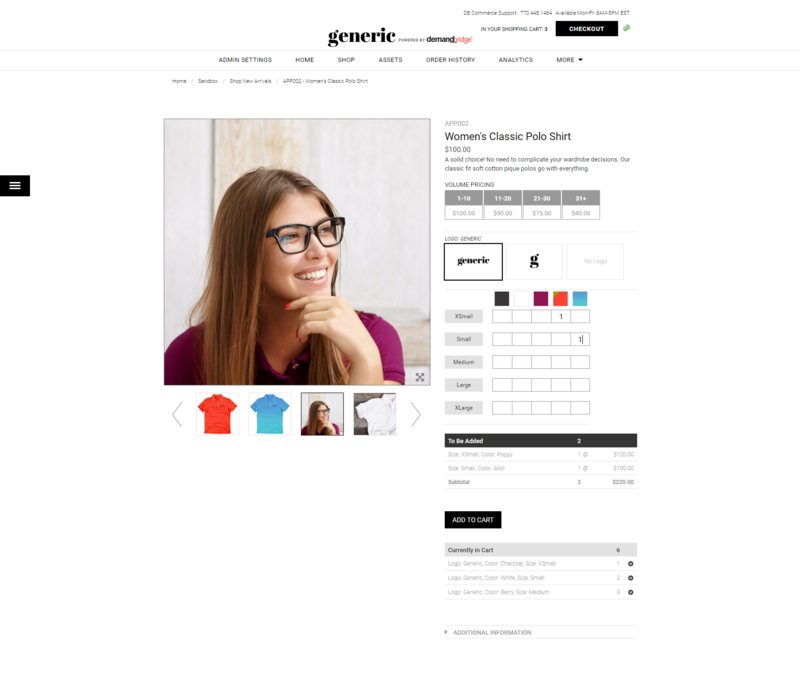 eCommerce site/template building) becomes more achievable. “Better to have their Back Office taken care of by someone solely focused on those activities. This sourcing exchange is a good example,” Rich said. Once created it will be powerful value-add from DemandBridge and its alliance partners. By outsourcing these activities, distributors can focus on what they do best, which is selling and delivering high quality print solutions and promotional goods...while exploring new types of marketing services they can provide to the loyal customers and brands they serve. Customers and brands count on distributors to help them achieve the best possible pricing for their print, promotional goods and marketing services needs. Distributors rely on technology partners to provide robust solutions to help them enable these services so they can win and keep accounts. At the end of the chain, suppliers crave access and opportunity...and help the distributors meet end customer needs. Smart buying: With DB Alliance, business owners can create approval rules to gain more insight into their users’ buying processes. Rules — and exemptions — are easy to create and can include multiple parameters (number of suppliers solicited, item cost, product type, etc.) to ensure that employees follow smart buying practices. Clear reports and insights: Real-time job tracking and dashboard-style reports — ideal for companies that must comply with contract/guaranteed pricing — allow users to analyze cost savings and buying patterns, and track metrics their clients care about. A single platform: DB Alliance interfaces directly with our proprietary accounting and inventory management solution, DB Distributor, so key information regarding customers, items, suppliers, and orders syncs seamlessly between the two products — eliminating redundancies across systems, and negating the need for third party systems of record and costly integrations. DemandBridge is Featured as a SPICY star in the CHILI Publish "SPICY talks 2018"
Amer Mallah, our Chief Technology Officer, and Michelle Bengermino, VP of Product Management, are both key speakers at SPICY talks 2018. This CHILI Publish conference is March 7-9 in Amsterdam, and we'll be speaking about the integration of CHILI Publish into our eCommerce product, DB Enterprise. Our industry is constantly changing and evolving. How can you find out where it will lead? Start in Scottsdale. Once every year, PSDA gives their executive members the opportunity to connect with the best in the industry, discuss high-level trends, and share ideas and challenges. Make sure you are part of the conversation. Join us March 5-7, 2018 in Scottsdale to discover the strategies to give your company an edge in 2018 and to learn more about how DemandBridge can assist in that growth. Last year was a monumental year as we "REIMAGINED" our company, and this year is shaping up to be even better. Come see us to learn about some of our strategic plans for 2018. DemandBridge, an integrated business platform delivering seamless marketing solutions in the cloud, today announced the acquisition of Kramer-Smilko, Inc. The acquisition furthers DemandBridge’s commitment to empower Distributors/Agencies with total quality control over their business, and the ability to maximize efficiency utilizing market-leading software and products. It also demonstrates the value of strategic partnerships and the commitment to providing the tools and expertise to enable their customers to grow. The new company will retain the DemandBridge name. DemandBridge and Kramer-Smilko, Inc. have been providing premier Distributor Management software for more than 30 years. With the recent union of e-Quantum, Inc., together, the three companies bring more than 90 years of experience and growth within and beyond the Independent Print Services Industry. The Independent Print Services Industry is undergoing a period of intense change that is rejuvenating the competitive landscape in an attempt to embrace and empower technology innovations. The new, independent company will be led by current DemandBridge CEO David Rich, who himself brings more than 35 years of Enterprise IT experience. John Smilko will remain with DemandBridge in his current capacity. DemandBridge will combine the vision, talent, technology prowess and investments of all strategic acquisitions in order to remain vital and competitive in the marketing automation software industry. Together, the new company will evolve and transition its products to leverage DemandBridge’s presence on the Microsoft Azure Cloud and to integrate technologies in the pipeline—from Microsoft PowerBI and Cloud Foundry, to other digital marketing technologies planned for 2018 and beyond. The combination and strategic focus will offer the scale, strength and flexibility to help customers and partners succeed with minimal disruption and the same/improved level of customer service. For years, the industry has known DemandBridge for its complete set of end-to-end tools—that is, technology that connects a company’s accounting, operations and inventory systems, as well as an e-Commerce portal and sourcing tool for on-demand marketing, promotion and print services. That technology is used by some of the industry’s largest Distributors/Agencies, over 3,000 loyal brands and 1.2 million registered users. The collective spend under management makes it one of the biggest Marketing Execution Platforms available in the market. "We continue to uncover opportunities to help our clients succeed in new ways," said CEO David Rich. "End user demands are changing, the brands themselves are changing, and the goals of our forward-thinking Distributor/Agency/Corporate customers are evolving accordingly," Rich continued. "Simply put, Marketing Service Providers who want to grow their businesses beyond traditional services (i.e. Print/Promotional goods)...will need more enabling technology than the previous generations. By consolidating the talents of DemandBridge, e-Quantum and Kramer- Smilko...and together with customers who have expressed willingness to co-develop with us...we will take a major step forward to providing the resources and technology platforms this industry needs to confidently approach business in the 2020's." Kramer-Smilko, Inc. has served the print sourcing and distribution market for 38 years. The software platform they have built, sold and supported now processes half a billion dollars in annual sales for its customer base. Kramer-Smilko has a strong presence in health care, banking, finance, and insurance, providing very sophisticated e-Commerce based supply chain management services. In addition to classic print management and distribution, they have integrated office supplies, print on-demand, digital content management, one-to-one marketing, promotional products, 3rd party fulfillment, and MRO inventory capabilities into its offerings. Company locations and corporate headquarters will remain the same. 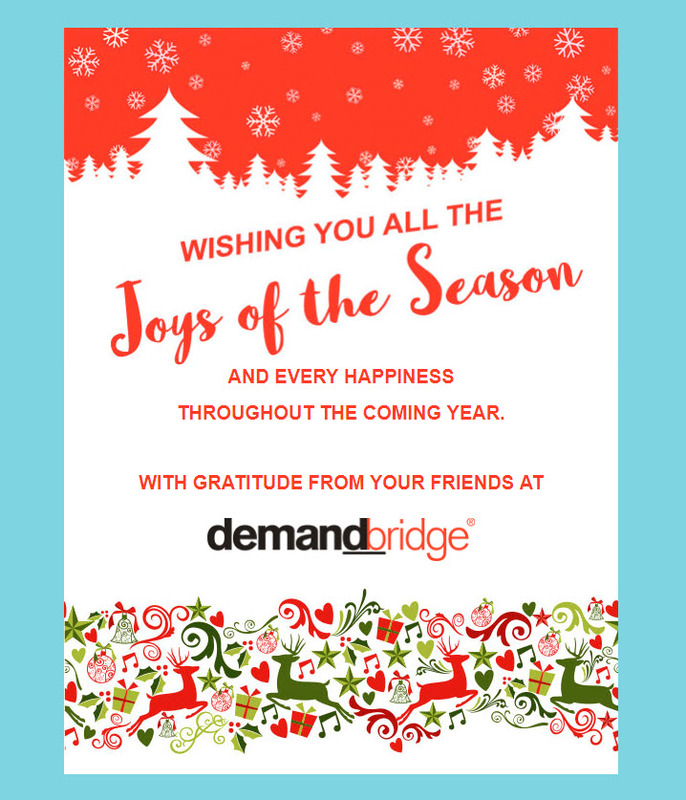 Greetings and Happy New Year from DemandBridge! We're very excited to announce some improvements we've made to DB Alliance. We've listed some high-level changes below, and we'll also be discussing them in more detail in our upcoming, complimentary webinars. As part of a larger company-wide effort to update the look and feel of our products, we've begun introducing new UI elements to both the supplier and distributor-facing areas of the application—most notably on the supplier user dashboard, supplier profile (and corresponding distributor views), and in the universal display of product specs and revisions. We engaged our UX designer to deliver a more structured and organized display of this often complex information. We've taken several steps to improve supplier visibility within DB Alliance and to encourage them to adopt the technology you've chosen for your business. In a relatively short timeframe, we were able to improve upon many of the supplier attributes (specialties, equipment, certifications, locations) and the UI elements used to manage them. These changes were made in tandem with other performance enhancements to the supplier search functionality, all of which were geared toward making it faster and easier to find the right supplier for the job.